"Bren Gun Carrier" redirects here. For the gun, see Bren light machine gun. The Universal Carrier, also known as the Bren Gun Carrier from the light machine gun armament, is a common name describing a family of light armoured tracked vehicles built by Vickers-Armstrong and other companies. 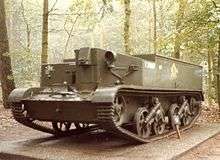 In 1934, Vickers Armstrong produced, as a commercial venture, a light tracked vehicle that could be used either to carry a machine gun or to tow a light field gun. The VA.D50 had an armoured box at the front for driver and a gunner and bench seating at the back for the gun crew. The War Office considered it as a possible replacement for their "Dragon" artillery tractors and took 69 as the "Light Dragon Mark III". One was built as the "Carrier, Machine-Gun Experimental (Armoured)" carrying a machine gun and its crew. The decision was made to drop the machine gun and its team and the next design had a crew of three – driver and gunner in the front, third crew-member on the left in the rear and the right rear open for stowage. A small number of this design as "Carrier, Machine-Gun No 1 Mark 1" were built and entered service in 1936. Some were converted into pilot models for the Machine gun Carrier, Cavalry Carrier and Scout Carrier – the others were used for training. The carrier put the driver and commander at the front sitting side-by-side; the driver to the right. The Ford Flathead V8 engine that powered it was placed in the centre of the vehicle with the final drive at the rear. The suspension and running gear were based on that used on the Vickers light tank series using Horstmann springs. Directional control was through a (vertical) steering wheel. Small turns moved the front road wheel assembly warping the track so the vehicle drifted to that side. Further movement of the wheel braked the appropriate track to give a turn. The hull in front of the commander's position jutted forward to give room for the Bren gun (or other armament) to fire through a simple slit. To either side of the engine were two areas in which passengers could ride or stores could be carried. Initially, there were several types of Carrier that varied slightly in design according to their purpose: "Medium Machine Gun Carrier" (the Vickers machine gun), "Bren Gun Carrier", "Scout Carrier" and "Cavalry Carrier". However, production of a single model came to be preferred and the Universal design appeared in 1940; this was the most widely produced of the Carriers. It differed from the previous models in that the rear section of the body had a rectangular shape, with more space for the crew. The Universal Carrier was ubiquitous in all the theatres of war during the Second World War with British and Commonwealth armies; from the war in the East to the occupation of Iceland Although the theory and policy was that the carrier was a "fire power transport" and the crew would dismount to fight, practice differed. The seven mechanized divisional cavalry regiments in the BEF during 1939–1940 were equipped with Scout Carriers - 44 carriers and 28 light tanks in each regiment. There were 10 Bren Carriers in each infantry battalion in the same period. A British Carrier platoon originally had ten Universal Carriers with three carrier sections of three Universal Carriers each plus another Universal Carrier in the platoon HQ. Each Universal Carrier had a non-commissioned officer, a rifleman and a driver-mechanic. One Universal Carrier in each section was commanded by a sergeant, the other two by corporals. 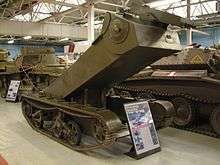 To allow the Universal to function as an artillery tractor in emergencies, a towing attachment that could allow it to haul the Ordnance QF 6 pounder anti-tank gun was added from 1943. 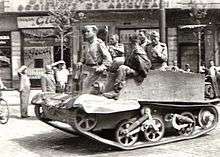 Normally the Loyd Carrier - which was also used as a general utility carrier - acted as the tractor for the 6-pdr. Canadian version of the Wasp flamethrower variant. The Carrier, Universal, T16, Mark I. was a significantly improved vehicle based upon those built by Ford of Canada, manufactured under Lend Lease by Ford in the United States from March 1943 to 1945. It was longer than the Universal with an extra road wheel on the rear bogie; making for a pair of full Horstmann dual-wheel suspension units per side, the engine was a Mercury-division 3.9 litre displacement Ford flathead V8 delivering the same power. Instead of the steering wheel controlling the combination brake/warp mechanism, the T-16 had track-brake steering operated by levers (two for each side). In 1942, at the request of the Italian Army (Regio Esercito), Fiat produced a prototype carrier copied from a captured Universal Carrier; it was known as the Fiat 2800 or CVP-4. It is uncertain whether production vehicles were manufactured. Bren carriers captured by the Italians in the field were often fitted with Breda M37 machine guns. Variants of the Universal Carrier have been used, among others, by the armed forces of the following countries. Red Army soldiers in Bucharest with British 'Universal Carrier' received from Lend-Lease programme (taken near Boulevard of Carol I., in August 1944). United States - 57 carriers en route for Canadian units in Hong Kong were in the Philippines when the Japanese invaded, 40 were operated by the 1st Provisional Tank Group. A captured and modified carrier, reused by the Indonesian nationalists during the fighting in Surabaya (Soerabaja) Java. 1 2 3 4 5 McNab, p. 142. ↑ "Britain's Bren Gun Carrier". 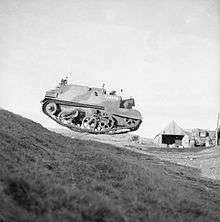 WWIIvehicles.com. 1940-05-10. Retrieved 2010-03-11. ↑ An Infantry Battalion (Higher Establishment), ref II/1931/12F/2, notified in Army Council Instructions 4 June 1941. ↑ An Infantry Battalion, ref II/233/2, notified in Army Council Instructions 19 May 1943, effective date 30 April 1943. ↑ Pier Paolo Battistelli, Piero Crociani. Italian Soldier in North Africa 1941-1943 (Warrior). Osprey. p. 62. Cecil, Michael K. (1992). Australian Military Equipment Profiles, vol 2, Local Pattern Carriers 1939 to 1945. Australian Military Equipment Profiles. ISBN 0-646-12600-8. Chamberlain, Peter; Crow, Duncan (1970). No. 14 Carriers. AFV Profile. Profile Publishing. Fletcher, David; Bryan, Tony (2005). Universal Carrier 1936–48: The 'Bren Gun Carrier' Story. Osprey Publishing. ISBN 978-1-84176-813-7. Harris, J.P. (1995). Men, Ideas, and Tanks: British Military Thought and Armoured Forces, 1903–1939. Manchester University Press. ISBN 978-0-7190-4814-2. McNab, Chris (2003). Military Vehicles: 300 of the World's Most Effective Military Vehicles. Grange Books. ISBN 1-84013-539-5. Watson, Nigel (2007). Universal Carriers Volume 1: Dragon – Armoured MG – Cavalry – Scout – AOP – Bren – Lloyd - Universal. Watson Books. ISBN 978-0955600906. Watson, Nigel (2008). 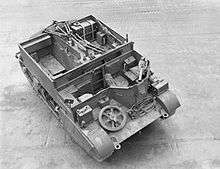 Universal Carriers Volume 2: Universal – Mortar – Medium Machine Gun – T16 – Windsor – Local Pattern – Oxford – Cambridge – Flamethrowers – Armoured Snowmobile - Variants. Watson Books. ISBN 978-0955600913. Watson, Nigel (2011). Universal Carriers Volume 3 (Drawing Archive): Variants – Parts – Hull Details – Restored, Project Vehicles & Wrecks – Veteran Experiences. Watson Books. ISBN 978 0 9556009 2 0. 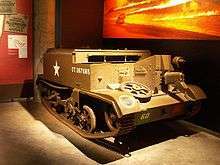 Wikimedia Commons has media related to Universal Carrier.